World 9-7 is the seventh level of World 9 of Super Mario Challenge from Super Mario Maker for Nintendo 3DS. This is based on World 7-2 from Super Mario Bros. 3 and 7-2 Remix (Piranha Plants) from Super Mario Maker. The course is exactly the same, especially the latter, though there are some different enemy placements and some of the Piranha Plants underwater have wings. 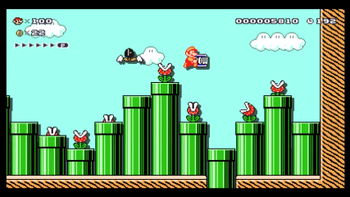 Goomba - Go under at least five flying Piranha Plants and then reach the goal. Bowser - Go under all flying enemies and then reach the goal. This page was last edited on June 27, 2017, at 15:31.